A healthy home isn’t something reserved for the rich and famous. In fact, it’s actually the opposite. Taking some easy steps to make your home healthier (and a little more green) may actually save you some money. Save money and improve your health; sounds like a win-win. Let’s take a look at some easy ways you can make your home safer and healthier. House dust = bad. It’s bad for allergies, bad because of the nasty microbes it carries, and it looks bad. Have you ever been over at a friend’s house and you find that everything’s covered in dust. It gives the clear indication of not being clean. Plus, it contains some pretty nasty chemicals and stuff you definitely don’t want to breath in (especially if you have small children). Household dust may include things like animal dander (if you have pets), chemicals (cleaners, polish, laundry soap, etc), pesticides (if you use them, like I do ­­– though rarely), and lead (if you live in a home with lead paint – like mine, which was built in 1967). And the worst part is that if you don’t clean old dust, it stays there and collects, and the nastiness compounds over time. In other words, the lead dust in the air from 15 years ago is still in your house if you haven’t cleaned it. Carpet can be bad (especially if it’s old), unless you keep it clean, clean, clean. Hardwood (or any other hard surface) is better for keeping dust at bay. But if you’ve got carpeting and don’t want to get rid of it, so be it – just vacuum. And, it’s highly recommended that your vacuum has a HEPA filter so that dust is trapped and doesn’t get blown back into the air. For best bets in the fight against dust, vacuum daily. If that’s not possible with your schedule, try every other day. The minimum should be at least two times each week (evenly divided within the week). Finally, experts recommend you clean the bag and filter each time you vacuum. Good luck with that one. The bags on my Miele vacuum cost almost $5 each if I remember correctly. I don’t think I’m going to be throwing them away after each vacuuming. Maybe the experts make more money than I do. If your house was built before the late 70s, chances are you’ve got lead paint in your home. Every home I’ve ever lived in was older than that. I grew up in a home in the Detroit neighborhood of North Rosedale that was built in 1926, and my current home was built in 1967. So, lead, no big deal, right? Well, wrong. See, lead poisoning can be extremely serious, especially to young folks. Lead poisoning has been proven to cause brain damage in fetuses and even small children. How do the kids get the lead in their system? Mostly by eating paint chips. Dust from eroding lead paint can also be a problem (another reason to keep the dust down in your home. So, the best way to avoid lead poisoning is to never have chipped or peeling paint in your home. If you see peeling paint, fix it. If you see chipped paint, fix it. And don’t forget to vacuum regularly. There are also wall coverings that will secure old lead paint. Be careful if you plan on doing major sanding of the paint. The dust could be a problem. Finally, many local/county health departments should offer lead tests. You’ll probably have to pay a small fee, but it’s worth it. Bugs and pests are, well, pests. They have that name for a reason. So we do what’s easy; we use pesticides to kill them. Ants, roaches, spiders, lawn grubs – you name it, we kill it. Fine. Well, not really. Sometimes the cure is worse than the disease, if you know what I mean. Like lead, pesticides can be very bad for the kids. They can aggravate asthma, and for large exposures, even cause brain damage. Is getting rid of roaches worth that? So what do you do? No one wants carpenter ants in their homes or, heaven forbid, roaches. First thing is to keep clean. If you live in an area with roaches (large urban dwellings, for example) and getting rid of them is impossible, make their lives difficult. Never leave food out. Close all containers tightly. Wash all dishes. Even cover up soap (roaches like to eat just about anything, believe it or not). They hate light though, so keep motion-sensing lights on. They’ll scare the roaches right out of your life. Check online for organic ways to kill roaches and other bugs. Keep all cracks sealed and make sure there are no damp areas in your home. Termites and roaches love dampness; don’t let them have it. And think twice about getting rid of spiders. They love bugs as much as you hate them. Spiders are hungry. Let them eat. Finally, if you absolutely need to use a pesticide, use it sparingly. Spray as little as possible and get one that is specific to the type of pest you’re trying to eliminate. You don’t need to kill what’s not bugging you. Literally. Should you filter your water? Here’s the thing. It’s pretty hard to find drinking water in the United States that isn’t good water. Study after study has shown that tap water is pretty much the same quality as bottled water. Often, in fact, it’s better. The EPA and local governments regulate tap water and ensure safety. Bottled water is not held to the same standards. Plus all those bottles create a lot of garbage. If you enjoy bottled water and insist on drinking it, so be it. It’s your money. 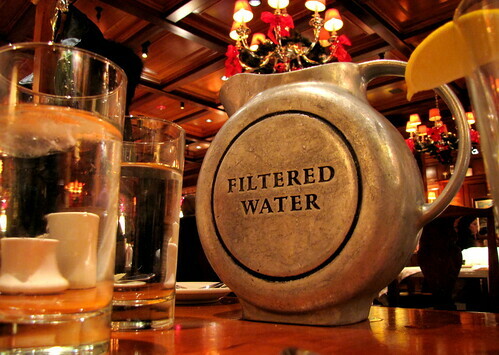 If you drink from the tap, your best bet is to filter it. That way you’ll ensure safe drinking water 100% of the time. You can either filter your water with a built-in filtration system (which I plan on doing) or filter it as you need it in a pitcher (which I do now – I use a Brita pitcher and love it). Clayton Closson is the director of content at Quicken Loans. A frequent contributor to the Quicken Loans blog, he specializes in Detroit economic revitalization and VA loans.